Join us today on a visual tour of the ruins of Portobelo, to discover stories of Spanish conquerors, pirate attacks and times long past, and then return to the Pacific coast on the transcontinental railway. Click on the pictures to get a full-screen slideshow view. The three forts of Portobelo Bay form part of the defence system built by the Spanish Crown to protect transatlantic trade. If you want to see more of Portobello and the train, join us on a day tour there! Email us at info@ecocircuitos.com for more information. Subsequent to Balboa´s discovery of the “South Sea” (the Pacific Ocean) on September 29, 1513, Pedro Arias de Avila, also known as Pedrarias, was appointed governor of Castilla del Oro in August 1514. Pedrarias and Balboa did not get along well and, finally, Balboa and four others were accused of treason and beheaded by Pedrarias at Acla, Panama, in the later part of 1517. Pedrarias continued to rule from Santa Maria de la Antigua on the Northern coast (Atlantic) of Panama in the region of Darien, but seeing the advantage of a settlement on the shores of the new ocean as an outfitting station for future explorations, he crossed the isthmus and, on August 15, 1519, the same day on which the Panama Canal would officially open 395 years later, he founded the first European city on the Pacific shore. The name “Panama” is supposed to have come from a Native word meaning “a place abounding in fish” and legend relates that the new town was built on the site of a Native fishing village. This new settlement is what we now know as “Old Panama”. In the same year, Nombre de Dios became the main Atlantic port. On September 15, 1521, the town of Panama was made a city by royal decree, and the first Diocese (bishop’s office) in the Americas was moved there from Antigua. For nearly two hundred years following the founding of Panama, the roads across the isthmus, Las Cruces Trail and El Camino Real, were the riches trade routes in the world. Not only did these two roads carry the plunder from Peru, beginning in 1532, but also the trade originating in the Philippines and the Indies. 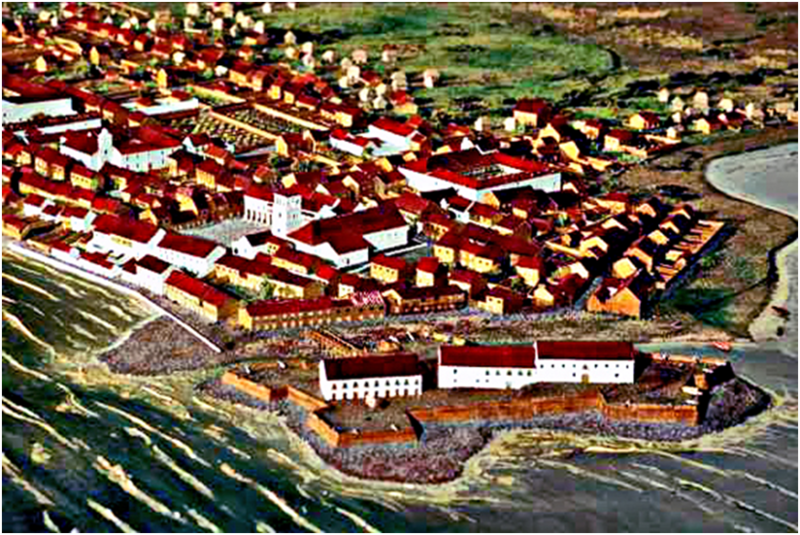 By the end of the 16th Century, the population of the city had increased to about 10,000. By the time of its destruction by the pirate Henry Morgan, Panama had a population of about 30,000. It was a beautiful place with 7,000 houses, most of them of carved native cedar and others of stone, erected in Moorish style ( a reflection of the Moors influence on Spain during their 400 years of occupation). Of its stones monasteries and convents, the most pretentious was the Cathedral of Nuestra Senora de la Asuncion, a truly glorious building whose ruins still stand. Besides the royal treasure storehouses, which were built of stone, there were some two hundred merchant warehouses guarded constantly by slaves. In addition, there were ample stables to house the large number of mules used for the transport of the treasures across the isthmus. The port of old Panama was really not the best for shipping because the 21-foot tide changes the waterfront to a mile of sticky black mud at low tide. The Bay itself was spacious enough for the largest ships to ride at ease at some distance from the shore. At one place in the bay, an arm of the sea creeps inland, North of the city, to a little creek over which an arched bridge, King’s Bridge, still stands. This bridge was the starting point of El Camino Real to Portobelo. The Cruces Trail started on the west side of the city at Matadero Bridge, also called “Morgan Bridge” because it was the bridge Morgan crossed to enter the city. In the end, it was an attack by Henry Morgan, with 1400 men, that sealed the fate of Old Panama on January 28, 1671. Morgan had an astute plan. He would sail to the Spanish Island of Santa Catalina, in the Archipelago of San Andres and Providencia, off the coast of Costa Rica and Nicaragua, to prevent the possibility of a warning of his proposed attack on Panama. Having captured the island, he kept most of his fleet in plain sight, while he sent James Bradley with 400 men to attack Fort San Lorenzo on the mouth of the Chagres. The fort was heavily fortified and Bradley’s men suffered many casualties, including Bradley who had his legs shattered by a cannon ball and died a week later, but they did capture the Fort. Of the 320 men at the fort, only 30 survived to surrender to the pirates. Shortly after the fall of San Lorenzo, Morgan arrived with the bulk of his force. In spite of Morgan’s plan of deception, the Spaniards became aware of his whereabouts and were preparing for the defense of Panama. Nevertheless, Morgan continued with his plan to go up the Chagres River to Cruces and then proceed by foot to the city of Panama. Leaving 150 men guarding the ships and 500 at San Lorenzo, he started his dangerous trip up the river on January 12, 1671. The men were crowded in too few Cayucos, took no provisions and the heat and mosquitoes were a nightmare. When they arrived at Panama, the strong Spanish garrison proved to be under very poor leadership and a series of errors and confusion gave the advantage to the pirates who overwhelmed the garrison. Morgan is credited with burning the city, but that is probably not true as his men were not through sacking the city when the fire started and drove everyone away. Having been denied the expected riches because of the fire, the pirates stayed around sacking what they could from the area, including a $30,000 ransom for a woman, for a month before returning to Fort San Lorenzo. Morgan had trouble controlling his disgruntled men and had to put several insurgents in irons. Finally, as discipline dissolved and Morgan heard of plans to kill him, he collected a band of trusted followers and, after getting the others drunk on the masquerade of a celebration party prior to dividing the treasure, he took off for Jamaica with most of the loot. But not without disabling the other ships so they could not pursue him. With the town of Old Panama in ruins, the remaining Spaniards rebuilt their town a few miles away in the present day area of Santa Ana and San Felipe. The city was never again sacked by pirates.